Learn to slackline: Amaze yourself. A friend of mine linked me to this BBC Horizon video, showing the presenter Marcus learning to walk a tightrope. Just take a second to watch it before continuing with this post. The line he walks in the video is very similar to the beginner slacklines I set up when I teach: low to the ground, quite high tension, about 10m in length. The differences being mainly that the slackline webbing is 50mm wide, a lot more dynamic, and a lot more accessible to everyday people than training tightrope at a circus venue. Slacklining can be done in your local park! The presenter is not too old to give it a go and to learn. He is challenged immediately when he steps on to the line. His positive level of frustration propels him to want to walk the whole thing. Unlike a computer, he is able to figure this new skill out for himself. When he turns his mind off, his muscles learn. When the mind is tamed, the body can express itself freely. He can’t calculate his way through the learning process, he just has to do it. I.e. Rational Thought in the moment does not compliment the experience of the moment. All of the above, and more, are exactly what my beginners go through when I teach them to slackline. As humans, we really do have this amazing ability to put ourselves into new situations voluntarily, and over time and consistent exposure, learn to adapt ourselves to the situation. Learning a new skill like slacklining, revolves around the same concept – consistently expose yourself to the situation of slacklining enough times, and you will learn to do it. You will be surprised. You will amaze yourself. Did you see how many times Marcus tried to walk the line in the video? In just one session, regardless of whether he made it or not, his ability to learn the skill of balancing improved. Along with all the other insights he will have gotten out of his session personally – mental, physical or otherwise. I encourage you, and challenge you to learn how to slackline. Whether it’s asking “Can I have a go?” on someone’s line in your local park, or whether it’s booking a formal lesson with a slackline instructor like me, put yourself in the unfamiliar situation of standing on a slackline and marvel at how you adapt and conquer it. 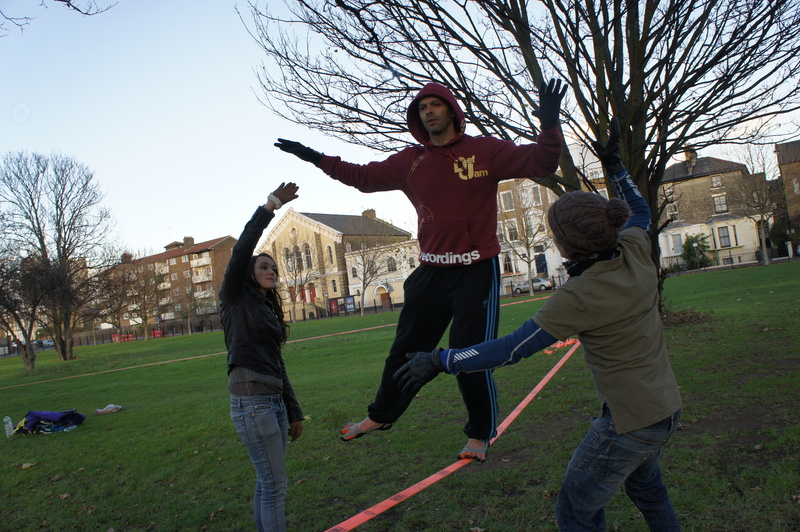 Harry Cloudfoot is a slacklining instructor based in London. If you think you’d like to give it a go, contact him here. This entry was posted in Balance, Slacklining and tagged balance, bbc horizon, circus, circus space, circus space london, harry cloudfoot, horizons tightrope, human intelligence, learn to slackline, marcus tightrope, program, slackline, slackline coach, slackline coaching, slackline instructor, slacklining, slacklining centre london, slacklining classes london, tightrope, tightrope walking, video by harrycloudfoot. Bookmark the permalink.